Great Z's: I Want That! For gearheads and electronics junkies like myself, the Consumer Electronics Show currently going on in Las Vegas is like a second Christmas. It's a nonstop display of all my aspirational purchases for this new year. So far I haven't been terribly impressed with all the new 4G Android smartphones (more speed, bigger screen, same old horrible cell phone reception) or tablet computers (Yawn. Hard to make a rectangular piece of glass interesting). But this picture really caught my eye. 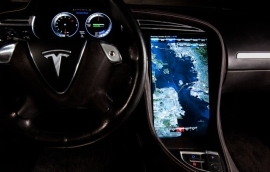 It's a 17 inch display screen in the new electric Tesla S sedan coming out in 2012. The size of the screen is just outrageous. It is powered by an Nvidia 8-core processor capable of generating HD quality video. The same processor also powers the 12 inch screen that will display the virtual instrument panel. Notice with the portrait arrangement it would be a perfect shape for surfing the web. How about watching HD video on the top half while still having access to HVAC virtual controls below that? This is awesome. I want that!